We love mentioning adjustments, especially in the playoffs. The Indiana Pacers find themselves behind 2-1 in the Eastern conference finals going into game 4, knowing they need to start doing something different as the Miami Heat keep finding answers to the one good thing the contenders are doing, as they constantly overcome slow starts from LeBron James who leaves his best for later in games. And that’s been a common theme with last year’s conference finals. The Pacers have led in 99 of the 144 minutes played so far, often going on very strong starts by playing great defense and pushing the ball into the paint. They managed to break away far enough and for long enough as Miami couldn’t catch up in game 1, but in the following losses the Heat have turned up their defense in the second half of games to bring everything to a halt and come away with the wins, as Dwyane Wade and James often take control completely in the final minutes. The Heat are averaging 19 points on 45% from the field in first quarter of games, and it wasn’t far from them finishing in single-digits during game 3 during the first 12 minutes. Their fourth quarter numbers? Averaging 26 points while shooting 53% from the field. Everything seems simpler with the game on the line, and the players start doing the right things, while their head coach puts them in a position to do so. The Pacers always seem like the waste their ammunition too soon. 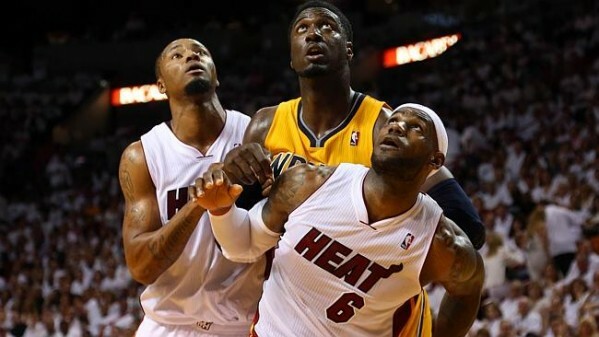 They do the right thing by pushing the ball into the paint for Roy Hibbert and David West to assert their dominance, but Hibbert doesn’t have the endurance and stamina to keep up that kind of scoring for a whole game, not to mention the Heat at some point not fearing him and attacking him in the paint, resulting in foul trouble. David West is a player who has confidence issues, and can be close to unstoppable for some minutes before shying away from the ball and taking tough decisions. The problems for Vogel being when that plan stops working. 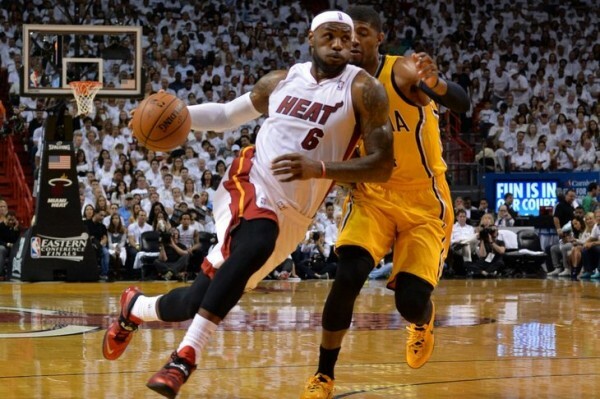 The Heat countered that by using both Chris Bosh and Chris Andersen in game 2 to resounding success. In game 3, giving up on Bosh during the first half and surprising with Rashard Lewis who did an excellent job on defense to help the Heat finally create some transition points made the difference defensively. Does Spoelsta have another change he’s going to share with us in game 4 if things get complicated? The Heat need to start better, that’s for sure. They have a few plays that go very well and for some reason don’t happen more, especially when James attacks the basket while Wade comes from the weak side, cutting to the paint. The Pacers have no answer for that one, especially if the Heat use a screen for Wade while James always takes two people into the fray. Their shot choices early on, often slowing things up and ending up with a tough one have made it easy for the Pacers in game openings. Adjustments or not, there’s on thing the Heat won’t be able to stop if it does happen: Paul George suddenly exploding and having a huge night. The Pacers get stuck at some point and never rebound from that, with George Hill shying away from the battle and Lance Stephenson too eager. Paul George is the balance and should be the answer, and if things stop working at some point in game 4, the Pacers need to get him more involved, which usually carries the entire team with him.